An all-star panel hosted by the Institute of Politics featuring professors, corporate founders, and public servants discusses public interest technology on Friday evening. High-profile leaders in the fields of public service, technology, and academia discussed corporate and public responsibility in an era of public-interest technology at an Institute of Politics event on Friday evening. 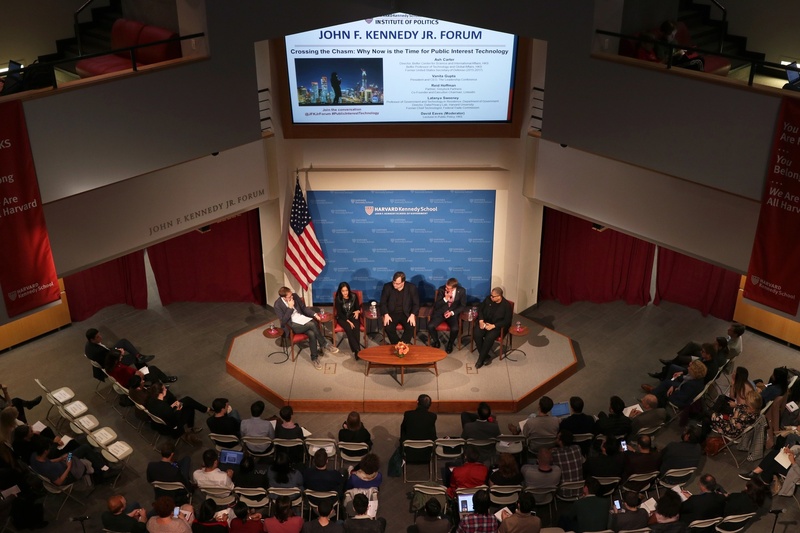 The four panelists, former Secretary of Defense and Kennedy School professor Ashton B. Carter, Government professor Latanya A. Sweeney, former head of the Civil Rights Division of the Justice Department Vanita Gupta, and co-founder of LinkedIn Reid G. Hoffman spoke before the packed John F. Kennedy Jr. Forum. “Technology is the new policy-maker,” Sweeney said later, referring to the life-changing but arbitrary decisions imposed by technology companies. She said technology companies’ fiduciary responsibilities to their stockholders may supersede their responsibility to the public. Hoffman remarked that there are a lot of other factors in tech companies’ decisions in addition to their responsibilities to shareholders. Sweeney responded that a company's stated social consciousness is not enough, pointing out the power of arbitrary decisions made by companies such as Google. “It is in fact a technocracy,” Sweeney said to applause from the audience. The panelists discussed potential reforms needed to address issues with technology by government, civil rights organizations, nonprofits, and tech companies themselves. Following the event, audience reactions were largely positive. “I thought it was really great. I thought it was too short, honestly. I wish it was two hours instead of one,” Aaron T. Altabet, a student at the Graduate School of Education, said. Lucas Lagos, a technical fellow at InternetLab in Brazil and researcher at the University of São Paulo, appreciated the opportunity to personally witness such prominent panelists discuss the issue. “They’re kind of role models for us. So to hear them, to be near them, it’s a great opportunity for us to get a little bit more energy like they’ve said to fight this fight that’s terribly hard,” he said. Speaking after the event, Gupta emphasized the challenge of addressing public interest technology in the future. Latanya A. Sweeney, a professor of government and technology in residence, and Sylvia I. Barrett, a lawyer, will take over as Currier’s two new Faculty Deans beginning next academic year.